Lettered LC: "Commodi Imp. Faciem Atque Habitum Herculis induti... Ant. Lafreri Sequani Formis Expressa Romae Anno MDL"
Weingarten Monastery, Swabia, 1632 (title page inscription in the NGA "Speculum"). Cistercian Abbey of Notre-Dame du Val-Dieu, Belgium (bookplate: Ex libris Vallis Dei). English export license recording the sale of this volume in 1974 by E.P. Goldschmidt & Co., Ltd., London; Daniel Donahue, Santa Barbara, CA; (Liber Antiquus, Washington, D.C.); purchased 2012 by NGA. Huelsen, Christian. 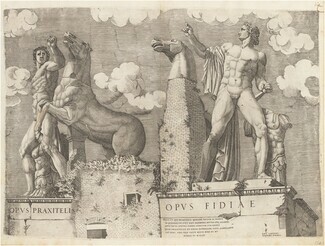 "Das Speculum Romanae Magnificentiae des Antonio Lafreri." Collectanea variae doctrinae Leoni Olschki. Munich: 1921: no. 58. Rubach, Birte. Ant. Lafreri Formis Romae: Der Verleger Antonio Lafreri und seine Druckgraphikproduktion. Berlin, 2016.